ExxonMobil and Chevron investors may be in for a lot more pain as the oil and gas slump worsens. 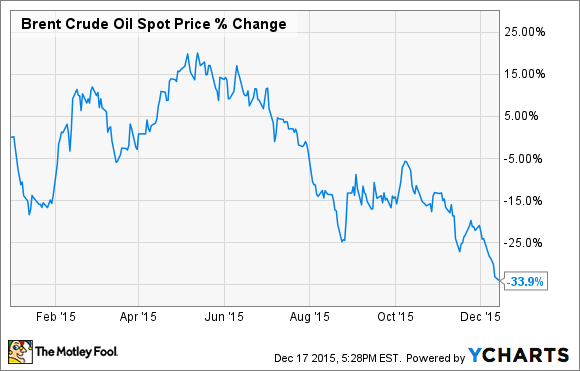 This hasn't been a good year for investors in Big Oil. Shares of the two largest integrated oil majors -- ExxonMobil (NYSE:XOM) and Chevron (NYSE:CVX) -- have plunged 15% to 20% each this year. ExxonMobil and Chevron Stock Performance, data by YCharts. Still, considering how far oil prices have fallen in the past year and a half, investors could be a lot worse off. The price of Brent crude oil has dropped 34% this year, even after plummeting 50% in the second half of 2014. Brent Crude Oil Spot Price, data by YCharts. Unless oil prices bounce back more than expected in 2016, ExxonMobil and Chevron are likely to see another steep drop in their earnings power. That could endanger the dividends of these two dividend aristocrats, which could in turn lead to more sharp losses for investors. Both ExxonMobil and Chevron have experienced huge earnings declines this year. At ExxonMobil, earnings sank 48% through the first nine months of the year, from $26.0 billion to $13.4 billion. Conditions were even worse at Chevron, where earnings plummeted 67% year over year during the same period, from $15.8 billion to $5.2 billion. All of the pain has come from the upstream operations that produce crude oil and natural gas. Meanwhile, the combination of falling crude oil prices and rising product demand has led to higher earnings from refinery and chemical operations. ExxonMobil is benefiting from stronger chemical and refinery profits. Image source: The Motley Fool. At ExxonMobil, upstream earnings slumped by nearly $16 billion in the first three quarters of 2015. However, the company's bottom line was cushioned by a $3 billion increase in downstream and chemical profits. At Chevron, upstream earnings completely vanished in the first three quarters of the year, plummeting to a $600 million loss from a $14.2 billion profit a year earlier. Fortunately, downstream earnings more than doubled to $6.6 billion from $2.8 billion. Right now, the outlook for 2016 is quite bleak. As bad as 2015 has been, the average price of Brent crude -- arguably the best gauge of global oil prices -- for the year will be a little more than $52 per barrel. Meanwhile, the Brent crude futures curve currently projects that prices will average about $40 per barrel in 2016. 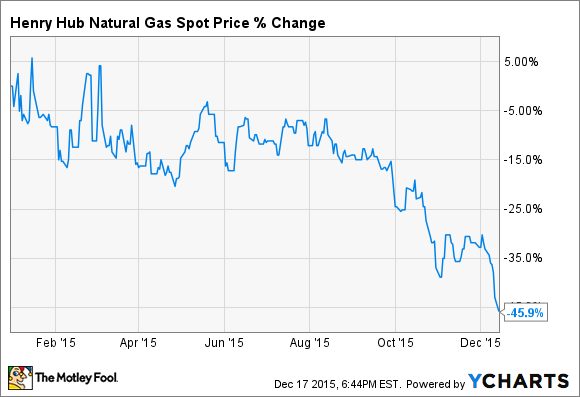 The story is even worse in the natural gas market. A combination of rising production from "fracking" projects and weak heating demand because of unseasonably warm weather has driven prices down to levels not seen since 1999. Natural gas spot prices have plummeted 46% this year -- that's even more than crude oil -- with most of that drop coming since August. Henry Hub Natural Gas Spot Price, data by YCharts. Meanwhile, it's less likely that ExxonMobil and Chevron will be bailed out by rising refinery profits next year. 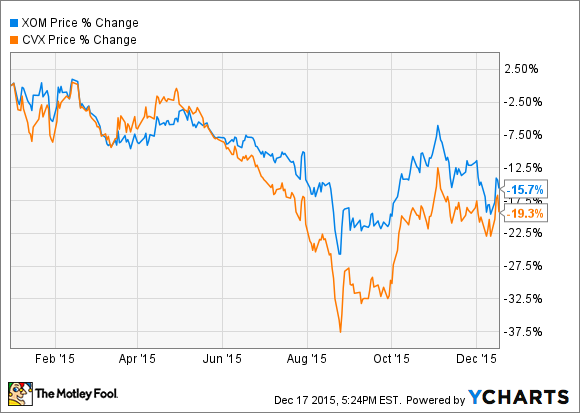 First, the comparisons will be much tougher after a strong 2015 for refining operations. Second, weak heating demand has sent prices for heating oil and other distillates plunging. This situation could offset the benefit of strong gasoline demand. Indeed, refining crack spreads -- the difference between crude oil prices and product prices -- are already starting to narrow on a year-over-year basis in many (though not all) regions of the world. Wall Street analysts don't seem to have fully incorporated this reality into their earnings projections yet. Analysts currently expect a modest 5% EPS decline at ExxonMobil next year, along with 4% EPS growth at Chevron. Unless oil and gas prices rebound, these estimates are way too high. Even as profit has plummeted at both ExxonMobil and Chevron in 2015, the two companies increased their dividends. Indeed, they are both "dividend aristocrats," companies that have raised their dividends for at least 25 consecutive years. The apparent stability of their dividends has helped prevent a greater rout in shares of ExxonMobil and Chevron. They already carry two of the highest yields among the dividend aristocrats. This placement helps to attract income-starved investors looking for high dividends. Chevron is one of the highest-yielding dividend aristocrats. Image source: The Motley Fool. However, without a rebound in energy prices, these high dividends don't look sustainable. ExxonMobil generated $7.4 billion of free cash flow in the first nine months of the year but paid out $9.2 billion in dividends. During that same period, Chevron produced negative free cash flow (even including its more than $5 billion in asset sales). It then paid out more than $6 billion in dividends, forcing it to take on about $8 billion in debt. ExxonMobil and Chevron are both moving fairly aggressively to reduce operating costs and cut capital spending for 2016 and beyond. However, this move isn't likely to overcome the cash flow pressure from even lower oil and gas prices, not to mention a potential slip in refinery earnings. In short, if oil and gas prices remain on their current trajectory -- or go further south -- ExxonMobil and Chevron may find that their dividends are simply unaffordable. Chevron is in the most trouble, because it is already burning cash in 2015. This situation could force it to cut its dividend in the next year or so, sending its stock plunging much further.